When I think about summer desserts, this homemade chilled Fruit Jelly is always the first thing that pops into my mind. It’s colorful, refreshing and light. Perfect to make use of the seasonal fruits! On a hot summer days, what are your favorite sweets to enjoy and cool down? One of my favorite is this see-through fruit jelly. 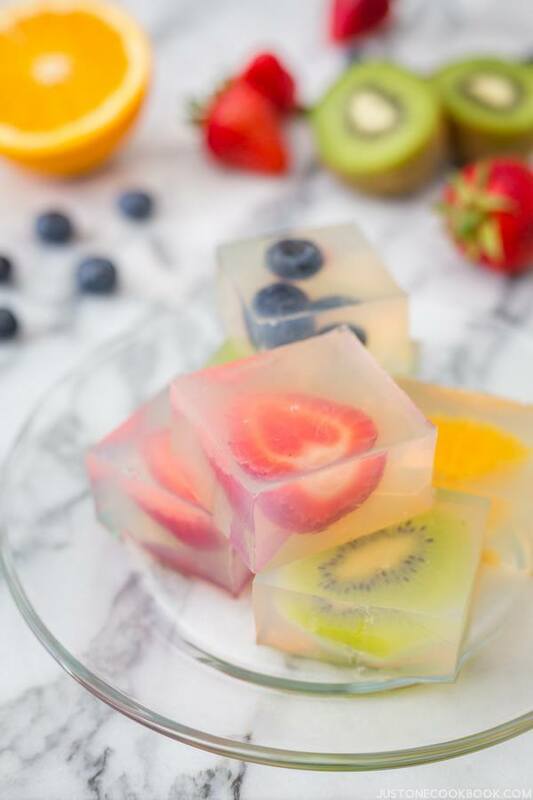 The see-through jelly reminds me of ice cubes and it makes me feel cool instantly, as I imagine the chilled jelly with refreshing fruits in my mouth. 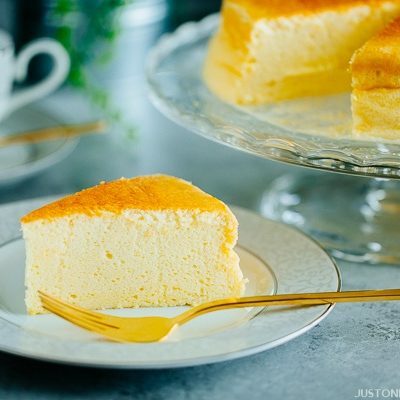 This quick and easy dessert recipe has been in my mind to share for quite a while, and now is the perfect time as I am still kitchen-less. Based on the latest estimate I might have a functional kitchen in 2 weeks… I just can’t wait. So I want to emphasize it’s super easy to make this attractive dessert. All you need is a portable stove, a small saucepan, a cutting board, a knife and a mold. 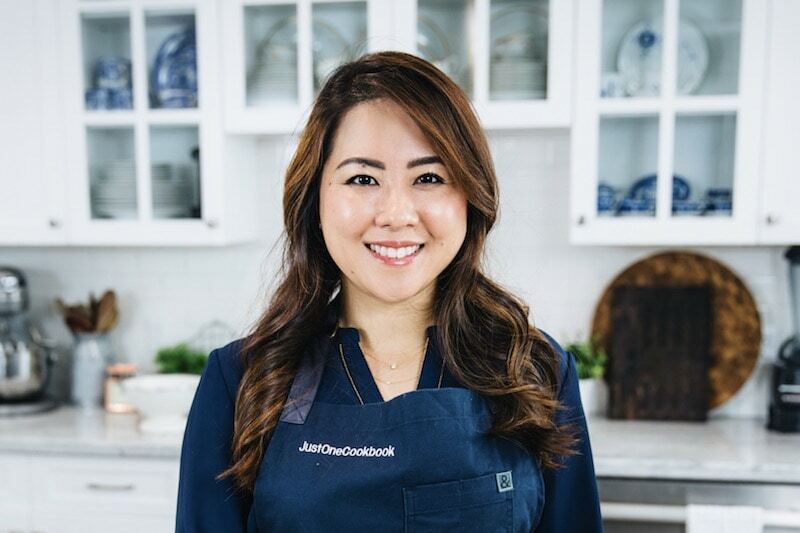 If you are wondering how I created this recipe, it was created in my upstairs office which is now also a kitchen/dining room. 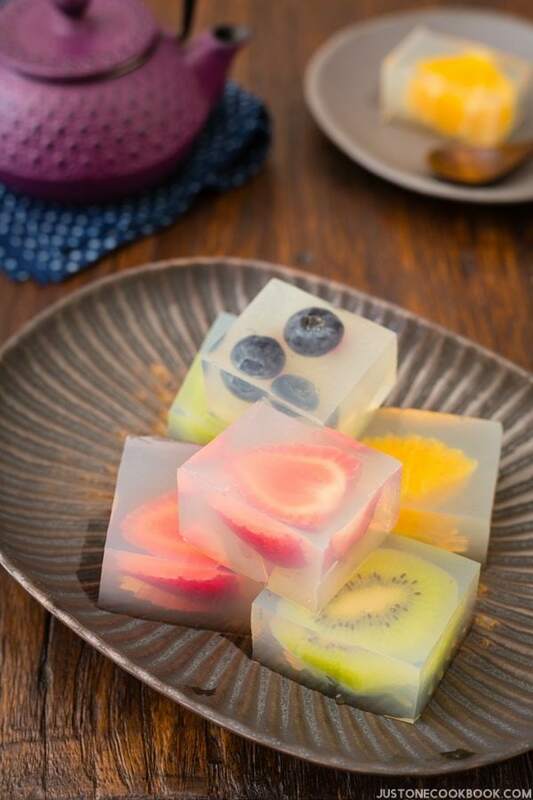 This jelly is made with kanten (agar) powder. In case you’re not familiar, kanten (寒天) or agar is a white and semi-translucent gelatinous substance, obtained from algae. Just like gelatin, it solidifies liquid. 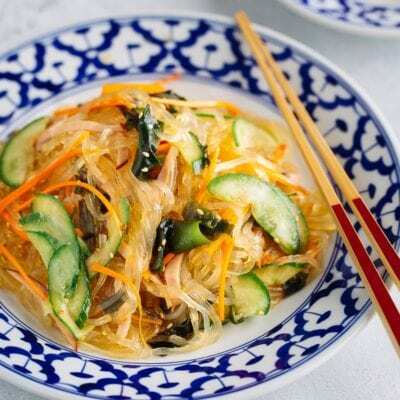 However, kanten (agar) is vegetarian and vegan-friendly, and it’s a great alternative to animal or chemical-based gelatin. If you want to know more about kanten (agar), please read my Agar/Kanten Page. For this recipe, I actually bought a traditional Japanese stainless steel mold with a removable inner tray called Nagashikan (流し缶). This removable inner tray makes it easy for you to un-mold the food, especially if the food easily sticks to the container. 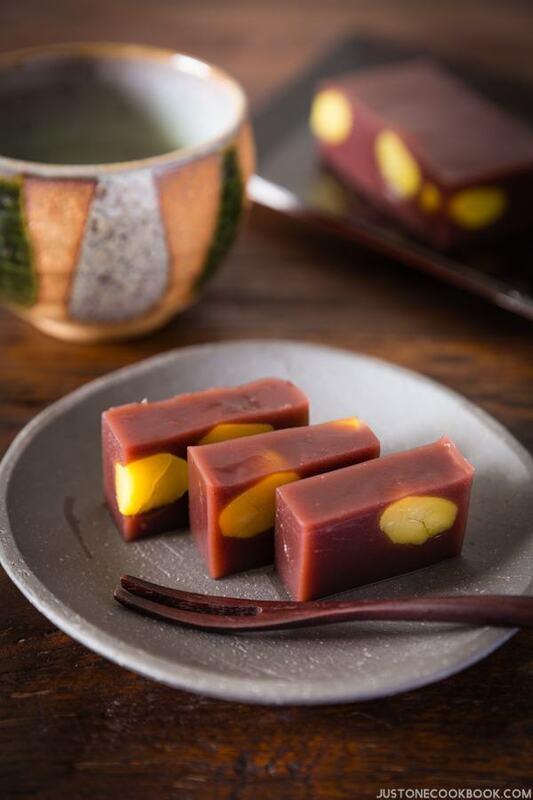 We use nagashikan to make Tamago Tofu (玉子豆腐) and traditional cold treats like Yokan (羊羹, azuki bean jelly). But no worries, if you don’t have this (or didn’t win my giveaway – details below), you can simply use a mold or baking pan with higher rim and place a plastic wrap on bottom of the mold so you can un-mold easily. You can purchase the mold from Amazon or Rakuten. Another option is to chop all the fruits in small cubes and serve this dessert in an individual glass cups. I usually make my fruit jelly that way and they look really pretty in a glass container. If you decide to serve this jelly in individual cups, reduce the amount of kanten (agar) powder to 2 grams. That way, the jelly is softer and jiggly. Today’s recipe requires us to cut around the fruits, so the jelly is designed to set firmer and it won’t jiggle as much. More explanation on this in the next section. If you prefer softer jelly texture that are not firm like my fruit jelly today, you can reduce the amount of kanten (agar) powder to 2 grams (half the package). If you do so, I highly recommend to chop fruits into smaller cubes, make the jelly in individual cups or a large baking pan and serve with a spoon. Less kanten powder will result in jelly that would jiggle (プルプルって感じ) and it will go through your throat smoothly. If you prefer to make this “ice cube” style, keep the ratio as it is. Besides the fruits I used for this recipe, you can use peaches, apples, and other types of berries. Also, canned mandarin oranges and peaches are great choices as well and the syrup adds additional sweetness. I recommend an assortment of colorful fruits that would look pretty suspended in jelly. I use 4 Tbsp. (1/4 cup) of sugar for this recipe. To call this dish “dessert”, 4 Tbsp. of sugar is absolutely necessary and it’s on the healthier side. If you want to omit sugar or use less, the fruits you use have to be super sweet or canned fruits in syrup. So, 4 Tbsp. for healthier jelly, and 6-8 Tbsp. for “dessert” fruit jelly. Please adjust the sugar amount to your liking. There are 4 types of kanten/agar (powder, stick, thread, and flakes) and you can use any one of them. 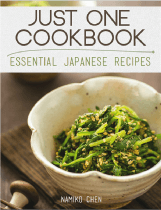 I used kanten powder for this recipe. 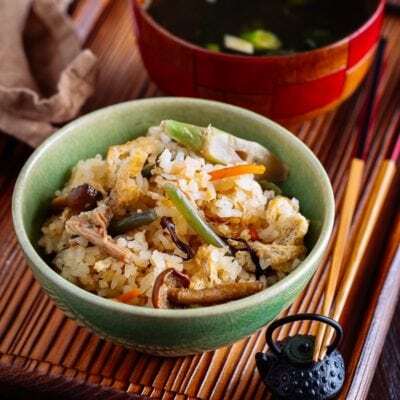 Kanten/agar can be found in your local Japanese (or Asian) grocery stores, and you can also purchase online at Mitsuwa or Marukai (for US residents). If you want to use gelatin instead, you will need 4 tsp. powder gelatin (8 g). Please remember the jelly made with gelatin will easily melt in the summer time while kanten (agar) will not melt at room temperature (read more here). If you have any question about kanten/agar, please read this post first. 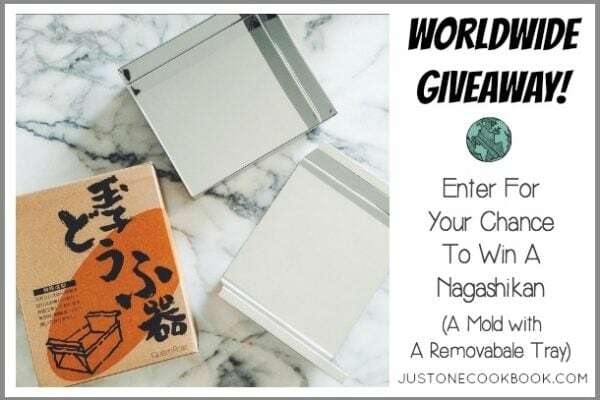 I’m giving away one (1) Nagashikan to Just One Cookbook newsletter subscribers. 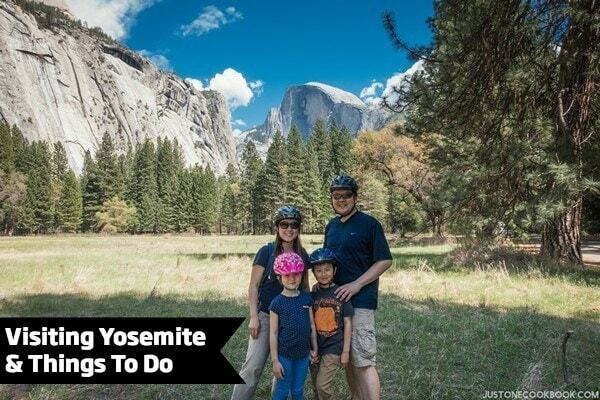 Please click here to enter for your chance to win! This contest is worldwide (everyone can enter)! In a small saucepan, add 2 cups (500 ml) of water and 4 gram kanten powder. Whisk to combine and bring it to a boil. Once boiling, lower the heat and cook for 2 minutes. Whisk occasionally and make sure kanten powder has completely dissolved. After 2 minutes, remove from the heat. Add ¼ cup (4 Tbsp.) sugar and whisk till sugar is completely dissolved. 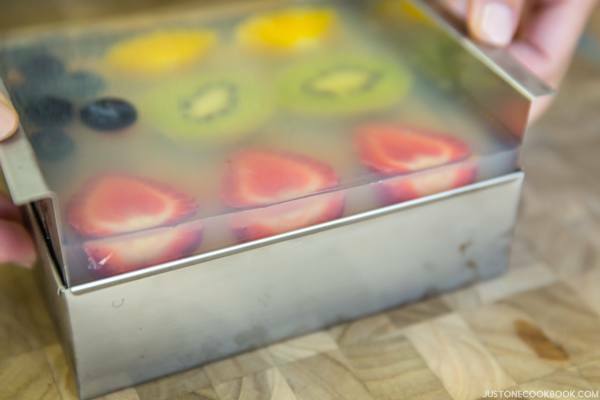 Run water in the mold (or nagashikan) and pour the liquid until there is about 1/3 inch (1 cm) in the mold (so that fruits won't touch the bottom). Using a spoon or toothpick, move the bubbles on the liquid to the corner and remove them. Let cool in the refrigerator for just under 10 minutes or at room temperature for a little longer time. Meanwhile cut fruits for the jelly. The thickness of the fruits should be about the same. When the bottom layer is slightly set (not liquid or completely set), place the fruits on top. If the bottom layer set too firm, the top layer will not attach to the bottom layer well and the fruit jelly will separate into top and bottom layers when you cut. The liquid in the saucepan should not be solidified since the saucepan is still warm and it has more liquid in there. If solidify, then re-heat till it turns to liquid. Then pour the rest of the mixture and pop/remove the bubbles. Keep in the fridge until the jelly has set completely. Run a knife around the mold and gently flip and unmold the jelly. If you’re using the nagashikan, run a knife around the mold and pull up the handles. Cut the jelly to around the fruits so they look prettier. Serve chilled on a plate. Sugar: 4 Tbsp. for "healthy" and 6-8 Tbsp. for "dessert". Please read the post. Your kanten jellies look amazing! I would like to try out your recipe but the only agar product I can find is ready made canned desserts that are sold in my local asian grocery store as “sea grass jelly”. It has a darr colour. Have you heard or tried some of those? Can it be the same agar? I wonder if you could make these with juice instead of water? My nephew loves the Japanese grape jelly candies and I thought I could make these with concord grape juice and grapes, reducing the amount of sugar in the recipe as well. Thanks! Oh, the dessert looks like little jewels–almost too pretty to eat! Thank you for sharing this recipe. It looks so refreshing! Thank you Donna! My kids were like awww, but then right after they ate them without hesitation. LOL. 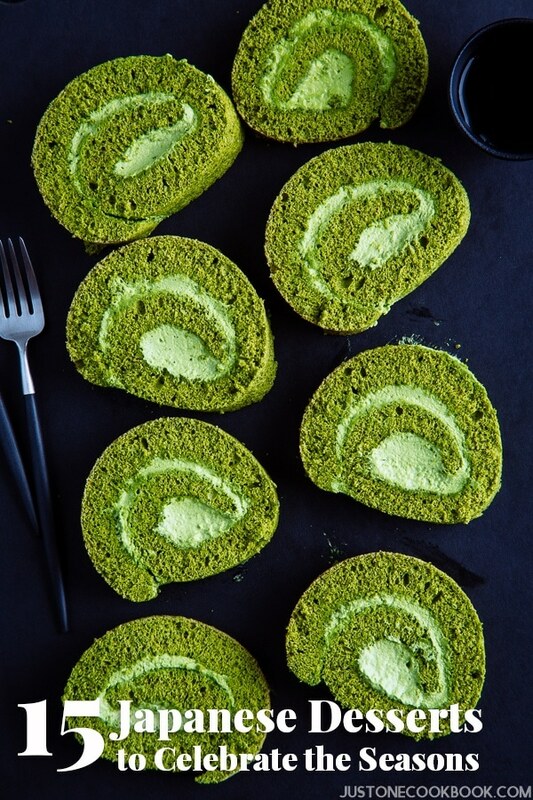 The beauty in your Japanese eye makes this such a very pretty recipe and not too sinful at that 🙂 ! Think agar readily available here . . .
My little family love your recipes, Nami! 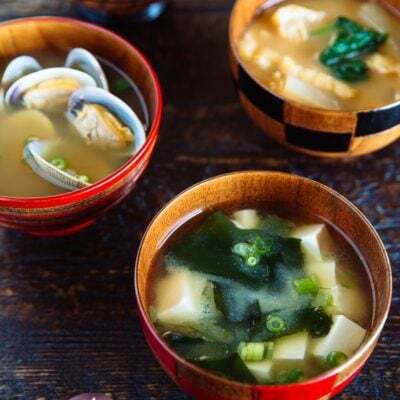 Chanced upon your website while looking for Japanese recipes to try and now my toddler is addicted to my homemade miso soup! 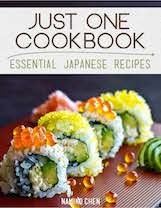 Would love to win the nagashikan and try out the jelly recipe! Your fruit jellies are beautiful, Nami! Your kids are very lucky to get these pretty homemade treats! It really is the perfect little sweet treat to serve on these hot days. Gorgeous looking jellies! Love how they showcase the fruit. Perfect end of summer dish — thanks so much. Nami-san, I’m wondering about the setting time. 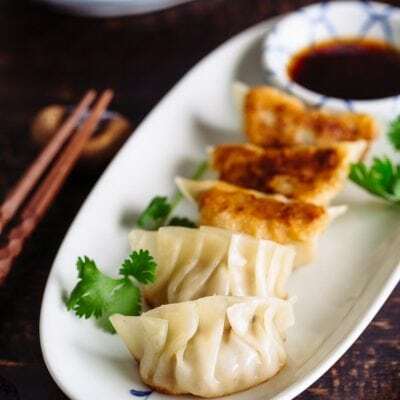 How long does it usually take in the refrigerator to set sufficiently to proceed with step 6. 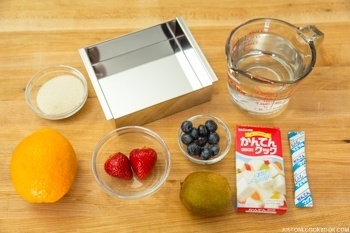 And since kanten will set at room temperatures, are there any precautions that need to be taken to keep the remaining mixture liquid while setting the bottom layer and arranging fruit? Should it be keep warm over low heat, or will it be fine for the length of time involved? Hi Mark! For the first layer of kanten (before putting fruits on top), it doesn’t have to be COMPLETELY solid. You will see the kanten is not moved by tilting the mold (I should mention in the recipe). When it’s not moving, you can already place the fruits. The leftover liquid is more amount than one in the mold, so it won’t set faster than one in the mold. You can just set aside and no need to keep it on low (you don’t want to evaporate either). But you’re right, we shouldn’t leave it out too long so the leftover liquid won’t solidify (I should also mention in the recipe). And you can keep it in the fridge for to have it solidify fast. Then it’ll be faster. Hope this helps! 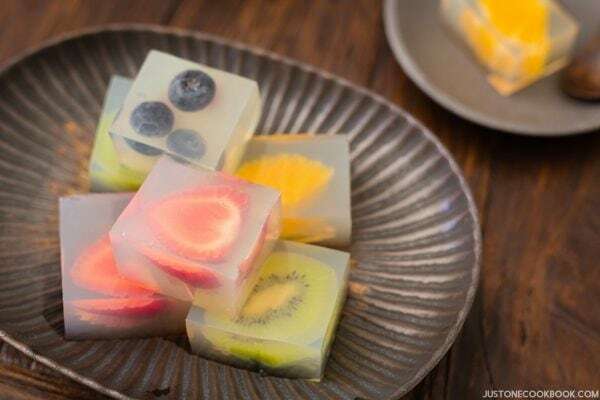 Hi Nami, if am going to do it in Jelly form and contain them in individual cups, do I need to follow the instruction of waiting for the first layer to harden just a bit before putting in the fruits or I can put them altogether at the same time. I LOVE it…!!! What a wonderful and beatiful idea to have fruit for dinner.!!! They look so nice! And so elegant! Thank you for thé recipe ! The problem is the bubbles between the two layers of jelly and at the bottom. Thank you for fast answer ! Yes I enjoyed doing this. I made it for a Japanese friend. Hi! The link in my e-mail brought me to your apple walnut salad. I did a search for this. I don’t know if it is just me, but I thought you might like to know. Hi Ann! I’m aware – I thought I copied and paste the new link (Fruit Jelly link), but I was half asleep when I was writing a newsletter and I didn’t do a good job… so it was still the previous recipe link (Apple Salad). So sorry about that. These are some beautiful treats! Thanks for the recipe!! I absolutely adore these jellies. I love the idea of making it in a big block and cutting it. 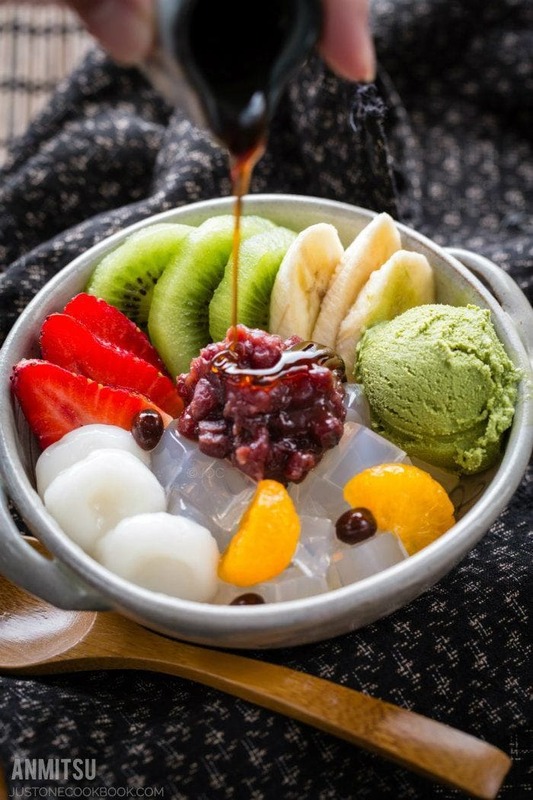 Perfect way to enjoy, lovely looking fruits, everything about this is amazing. These look like a tremendous amount of fun! I love jello, jellies anything with that gelatin or agar texture. The fruit incorporated into the jellies like that sure make a pretty little sweet treat. Hi Nami, it is my first time commenting here although I have visited your site plenty of time. Your recipes are very fun to make, look very good and taste delicious. 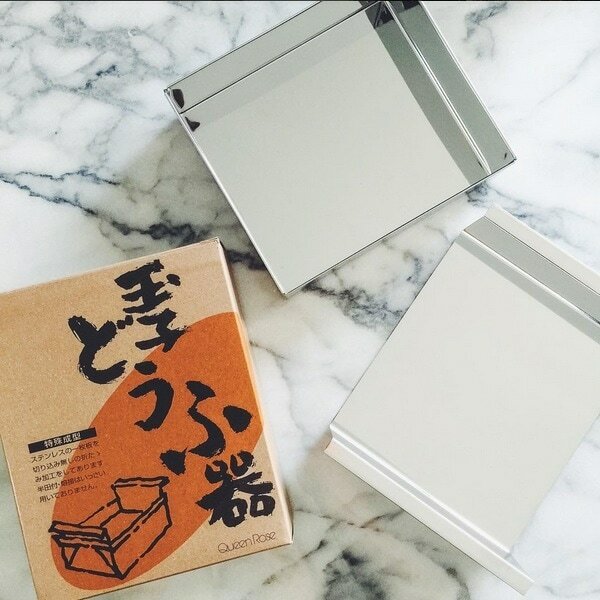 I am visiting Japan, and I would be very grateful if you could please tell me which store(s) in Osaka and Tokyo I can get the nagashikan you used here? I think the size is very ideal and the item itself is very versatile. Thank you very much for your help. Hi, if we can’t finish all the fruit jellies on the same day, can it be kept in the fridge and for how long such that the fruits won’t turn brown or bad? 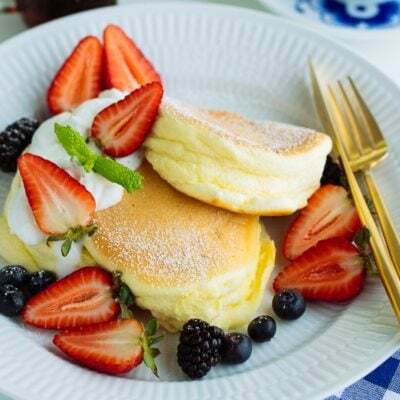 Hi Nami, I love your recipe and it looks easy to make : ) May I ask if we use the fruit juice instead of water to make more flavour to the jelly? Thank you very much. I have quite a bit of powdered agar here at home; it’s a staple for vegan/vegetarian cooking. I made these fruit jellies the other night. They were great! Very refreshing. My family loved them. My agar (jelly) didn’t come out clear like yours in the picture, but I think it’s because I use organic sugar which is slightly brownish. But other than that, they turned out great. Using the nagashikan was terrific. I love the tip on how to remove the little bubbles. That worked great. I’ve made kanten (from agar sticks) for New Year’s before, but I never knew how to get rid of the bubbles. Now I do. Mahalo! Hi Debbie! Yeah I think the unclear part is from the sugar. Nagashikan works great for the jelly, doesn’t it? I love this clever tool! Yes, bubbles popping is fun. It’s always my kids’ job. 😀 So happy to hear you enjoyed this recipe. Thank you!! Hi Nami, I made the recipe following your directions but the two layers of kanten separated when I cut up the cubes. I only let the first layer set till it was not moving and put the fruit in then poured the second layer. But when the second layer has set the two layers easily come apart. The kanten was the stick variety we purchased in Japan (from a supermarket) on a trip there recently. It set quite firm. 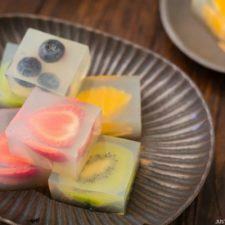 I only put one smallish piece of fruit in each cube and used a nagashikan to mould. I will keep experimenting as I liked the recipe. Thank you for letting me know. Hope you’ll be able to adjust and achieve the right consistency and the jelly will be nicely set! Good luck! Try drawing some lines with a toothpick on the first layer before pouring the 2nd layer over. The gap between the drawn lines will help to stick the 2 together. Hi Elisa! Thank you for your great tip! That’s a cool trick and I’ll definitely remember to use it next time! hi Nami, 4g of kanten powder is equivelent to how many tablespoon? thank you. I really like your recipes! Is it possible to make this with icecube molds? I have a bit of trouble finding the original mold where I live. 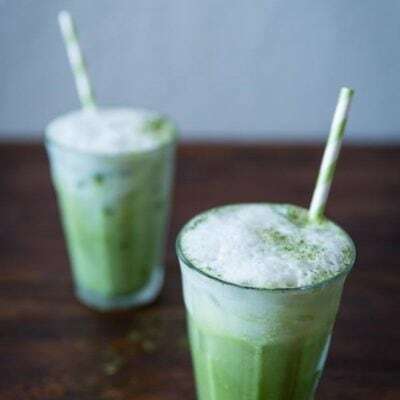 I’m planning to make these over the weekend and I was wondering if I could use a sugar alternative like stevia instead of the sugar? I read this receipe with interest. I have a query, may I know where to get the kanten powder? I was looking for it in Singapore but can’t find in supermarkets. I used 2 tsp of Kanten powder for 2 cups of water, but it didnt solidify well and it looked more like ‘jiggling jelly’ instead of firm jelly cubes. Should I add more Kanten powder? Or was it the fruits (strawberries and canned peaches) I used the problem? I love your recipe so very much !! Your description is very clear and thoughtful!! Easy to understand too! 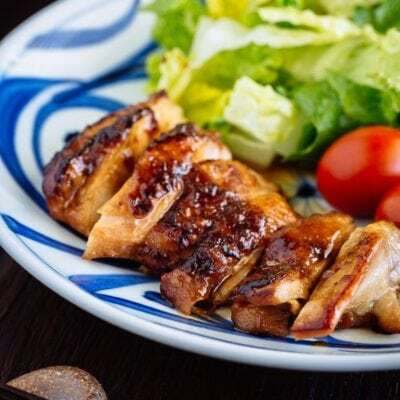 I love the Nagashikan….this is something I am looking around…thank you for the recommendation! I am going to make it for the Christmas party and my girl’s birthday party! Hi Crystal! Thank you for your kind words! Nagashikan is very useful and I love the simple yet smart design. Hope you enjoy making the dessert for the special occasions! oh cool! Can you make these in an ice cube tray, or something like that in a design? Do they really taste good? Hi Jessica! If it’s easy to unmold, sure. I guess it depends on the tray? Maybe silicone mold may be much easier to unmold. The taste is rather simple. It’s traditional Japanese sweets, so it’s not very sweet. 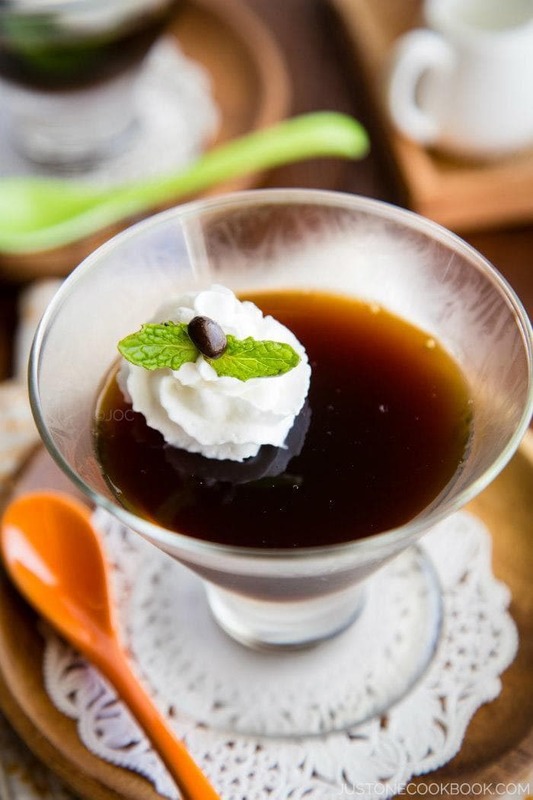 We sweeten this dessert but for some people you may want to increase the sweetness. Hi! thank you for this recipe! I was thinking about making these for Christmas but I would only be able to afford one of the nagashikan’s so I’d have to just do them in batches for nine for several people…and so I assume it will be a several day process. I was wondering how long these are usually good for. Or if there is a way to store them for them to last longer?